This big red zinnia was in my garden and is one of my favorite flowers because it is so full of summer! A common sight here in Vermont and one that bodes well with watercolor. 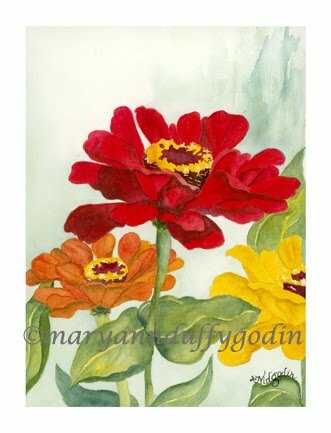 I love zinnias because I know them and feel comfortable painting them! I used Quin Red, Aureolin, and Scarlet Red to get the rich red on this flower along with their complement for the shadowing. I love red! Labels: Flower: "Big Red Zinnia"